Have you ever had this feeling that the person you just met, you were meant to meet? Have you ever felt a strong connection with someone that you didn’t know his/her existence? My friend Sam and I went to a trip in Surat Thani, south of Thailand. After 8 years of friendship we finally ended up realising our long overdue trip together. We left with the idea of pursuing nature, exploring the unknown and capturing moments. After a 2h journey from Bangkok, we arrived in Khao Sok Silver Cliff Resort, just a few simple but charming cabins backed by a majestic limestone cliff. Here we are, a gem in the middle of trees, rocked by the noise of the crossing water stream and the loud crickets, surrounded with the smell of fresh leaves touched by the morning rain. We are greeted by Karen, a delicious and smiling Scottish lady living in Thailand for the past 10 years and taking care of the hidden bungalows for 3 years now. She loves Thailand, she speaks Thai and really adapted herself to the culture and identity. We confessed that we would like to experience some adventurous activities in the nature with a visit of the National Park, and if possible, to encounter local people living here. She immediately knew what we wanted. 8am, we are now ready for this Jungle trip in Khao Sok national park, a vibrant greenery jungle with scattered towering limestone formations, eager to explore the local wildlife and flora. We cover our full body to avoid leeches and other insects that could make our skin a real feast and meet Nit our guide for today. Nit is a short 65 years old man with a thick mustache, and a face marked by years of experience. He speaks a little English but more than enough to show us around the jungle. We enter the park after getting our lunch boxes and declare ourselves to the park rangers. Soon after our first steps, we are quite impressed. All his senses are already awakened. He spots everything, regularly stopping our stroll without a word, examining the remains of what looks like early monkey’s breakfast or the fresh 40cm footprints left by wild elephants making their path in the dense wet jungle… Any noises coming from the jungle is a source of life and step by step we learn from Nit how to observe and listen. Nit has deep roots in the jungle, he has been a guide in the Park for decades, and before that, used to be a hunter in his young age. So yes, Nit knows the jungle like the back of his hand and soon leads us off tracks in his former hunting-ground. Soon the monsoon rains hit us and will last basically until the end of our trek. But, we are just following Nit, happy that we found this unique character, short but strong, old but with sharp eyes, hunter but now protector of animals. He is no cutting away the branches to make a way through the thick vegetation, guiding us on muddy and slippery slopes making sure time to time that we can follow. Sam and I didn’t complain, and to be honest I was quite grateful to be with Nit during this trip. For some reasons, we blindly followed him totally wet from the rain but enthusiastic. Ending up our trek, we open more discussion with Nit and ask him what he is doing while out of the jungle. He tells me about his garden and farm not so far from our accommodation. My curiosity pulls me out asking him to visit his place. Because, yes, it should be wonderful. Based on all the knowledge he got from his environment, his love for living species, and seeing how caring he was toward us, we ceased the opportunity to discover more about him. Over there, we also meet his son, Chanyoo or Yoo, which is also a guide for the Park and taking care of the recently built homestay. His wife Tim is leading the cooking classes for the guests and together they aim to offer an authentic “farm stay” experience to the tourists. Coincidentally, the funeral going on in the village is for Tim’s father, and we told her Karen invited us to attend. She was thrilled and insisted for us to come and being a part of the celebration. Before dusk, Nit drove us back and we were, the three of us, quiet and just happy. Happy meeting each other, under the monsoon rain, stepping on the mud, blood sucked by the leeches, but happy we shared this short encounter. I learned how to blindly trust someone I don’t know at all, and to grow some kind of affection and love to this old man. While we said goodbye, he hugged me like a father hugs a daughter, and tried to hide his shy tears. I was freezing from my wet clothes, but also full of warmth touched by his kindness, his love and our unexpected encounter with my new adoptive father. Funerals in Thailand, is not like a funeral in France. Funerals in Thailand can last from 2 to 5, or 7 days. It is a time where family and friends of the defunct, gather and share tears but also good time remembering cherished moments together in the home of the dead. The monks together with the family will decide how many days the funerals will last, and days and nights, members of family alternate to stay awake and look after the defunct body. Funerals in Thailand is about spending the last moments in joy with your loved ones before their body leave Earth for good. 7pm. Karen is leading us just in front of her house, crossing the road we head to the funeral celebration not knowing what to expect at all. A man is welcoming us in a perfect English. He is Tim’s brother, coming straight from Finland to say goodbye to his father. Tim’s family is actually composed of fifteen siblings, some are living close by or from different parts of Thailand, others in Europe. We are quite surprised that, coming from such a remote part of Thailand the relatives are now scattered into different places around the globe. Tim greets us and make us sit at one of the empty table for the guests. 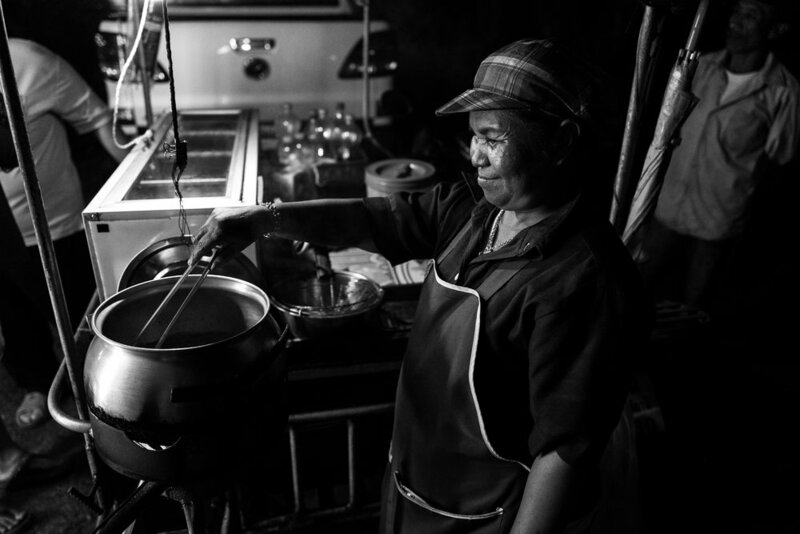 She immediately calls her sisters to prepare some plates: caramelized pork, stir fried vegetables, mushrooms, lemongrass chicken, peas, vegetables soup, a real feast made of locally grown products... Karen hands her an envelope. This is the tradition in Thailand, just like for weddings, funeral is a celebration that cost money to family and you come to mourn with the family but also to support financially. Away from the dining area, the late father’s body lays under another tent. The coffin is adorned on its top with a glittering model luxury house made of cardboard. Probably if they burn these type of paper offerings with the coffin, the dead person will receive them in the afterlife and put them to use. While monks are chanting prayers in the background, family members knees on the floor to receive the last blessings, and other guests are sitting on chairs, some of them crying and others praying. Overwhelmed with such hospitality we start feeling more comfortable and begin interacting with the audience taking some pictures and trying to embrace the celebration. 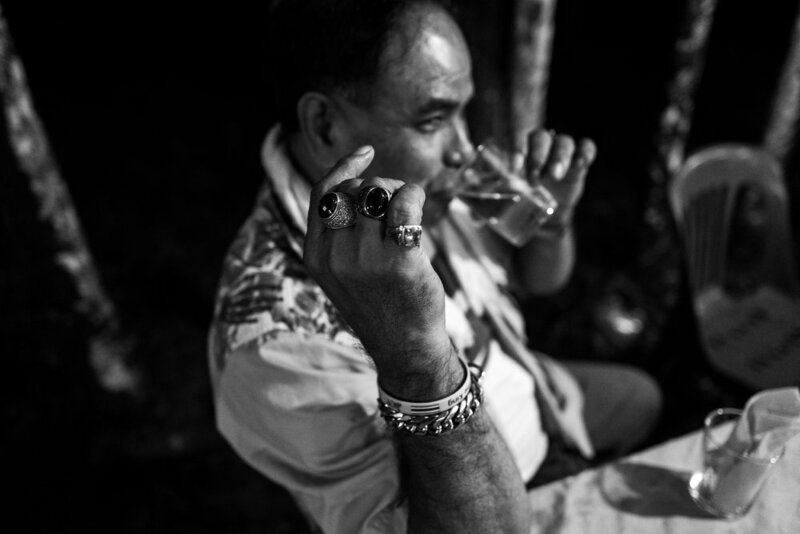 In the attendance, we notice this man with all his shiny and colourful rings with nearby a circle of people playing cards and smoking “beedi” cigarettes. Some others are drinking a local whisky while a street vendor is delighting kids with snacks and skewers. Guests from all ages are gathered and we don’t feel any sadness but rather a convivial moment full of life. We embrace the moment, we sit down with the brother from Finland sharing a few whisky glasses, stories and life experiences, laughing and teasing each other. We soon move to the family table, Tim introduces us to each members and we feel ourselves now part of the closed circle, as privileged guests and at the center of the attention The eldest sister keeps feeding us with some meat and we spend another couple of hours drinking and cheering. And yes, the brother is right. Life is very simple. Even in supposedly sad events, you can find joy. How did we end up there? What pushed these local people greeting us to the most intimate celebration, offering us food, drinks, alcohol, and taking care of us while they are the one who needs attention and comfort? Have I mentioned to you how deep the connection can be between people you don’t know? We came back home full. Full of food, and tipsy. Full of confusion, drown into Thai culture, and drown into the heart of a family. Full of emotions, sadness for the death, lively for the sharing smiles and laughs. We felt touched and blessed and a deep feeling that we will come back here. This day, from the jungle trek to the funeral, taught me something: in the most difficult moments, under the storm and a very tough path, or during your saddest times, prepare yourself to be enlightened. From the bottom of my heart, Khap Khun Kha for this unforgettable day. To Leung Nit and Pi Tim’s family.